Adrian Hallmark has held top jobs at VW, Bentley and Porsche. 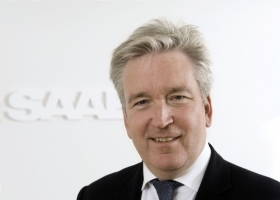 Saab has named former Volkswagen executive Adrian Hallmark its executive director of sales. Hallmark (pictured) starts immediately and will be counted on to help Saab try to rebound from its near collapse earlier this year. He will be based at Saab's headquarters in Trollhattan, Sweden, where he will report to Saab CEO Jan Ake Jonsson. "Over the next 16 months we will be launching three new products -- the 9-5 sedan, the 9-4X and the 9-5 SportCombi -- Adrian's contribution will be vital in optimizing the sales of these exciting new products," Jonsson said in a statement. Saab's former owner, General Motors Co., was on the verge of closing the money-losing Swedish automaker this year but instead agreed to sell it to Dutch supercar maker Spyker Cars NV. While GM tried to find a buyer for Saab, the brand's 2009 sales fell 58 percent to 39,903. Saab built just 20,791 cars last year, but Jonsson says this year's aim is to boost output to between 50,000 and 60,000 units and to 120,000 units by 2012. Hallmark, 47, takes over Saab's global sales operations from Knut Simonsson, who will remain Saab's brand and marketing executive director. In the statement Hallmark said: "With three new products about to be launched and a re-energized dealer network in place, I look forward to building sales volumes and reinforcing the brand's presence in major markets around the world." Hallmark was VW's head of sales in India and Asia-Pacific until leaving the company last August. Before that, he spent more than two years as executive vice president at Volkswagen of America. The British native came to VW of America from VW subsidiary Bentley. He was the UK luxury brand's head of sales and marketing from 1999 until October 2005. Hallmark's career also includes a stint as managing director of Porsche Cars GB Ltd.
Saab Automobile today announced the appointment of Adrian Hallmark as Executive Director, Sales. Hallmark joins Saab's senior management team from Volkswagen, where he was Executive Director of Asia, responsible for operations in 50 markets, including China and Japan. He takes up his new position with immediate effect and will be based at Saab's headquarters in Trollhättan, Sweden, where he will report directly to Saab Automobile President and CEO, Jan Åke Jonsson. Hallmark assumes responsibility for Saab's global sales operations from Knut Simonsson, who retains the position of Executive Director, Brand and Marketing. Hallmark is a former Managing Director of Porsche Cars GB Ltd and has also been responsible for Bentley's global sales, marketing and PR activities. He served as Executive Vice President Volkswagen of America Inc, based in Detroit, before taking up his position as Executive Director of Asia.